One of the most iconic images of residential mid-century modernism was made possible by Frank Sinatra. 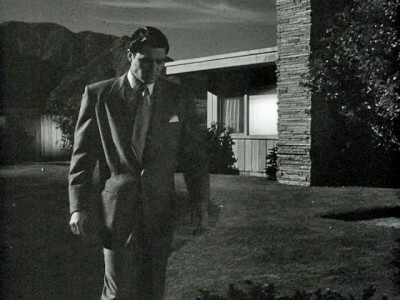 Though he only lived in it for 10 years, the home is forever associated with him, and still inspires retro fantasies. As cover art for a CD EP we did earlier this year, I chose the shot above because it combined two things I love: Julius Shulman and Ole’ Blue Eyes. Now, both of my 70-something parents didn’t care much for the music within, but when they saw the CD cover they both immediately identified it as Frank’s place. How’s that for architectural staying power? The place is known as Twin Palms, and is now for rent as a Palm Springs party palace or the ultimate background for a photo shoot. The official website has all the details, plus a great history of the home, which hipped me to something I did not know: Sinatra’s place was used as a location for the Joan Crawford film The Damned Don’t Cry. 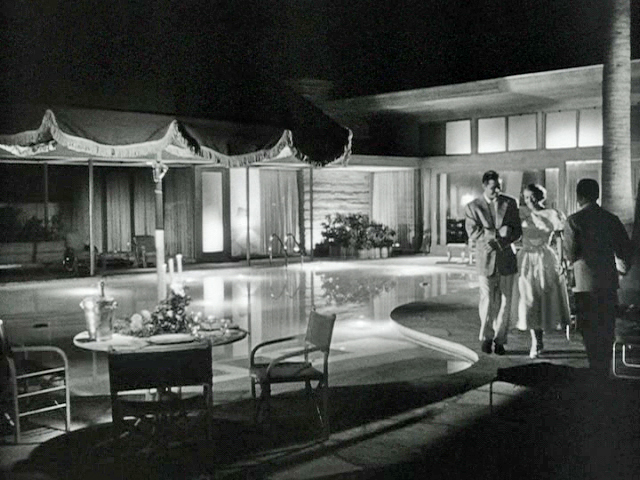 I’ll take every opportunity to wallow in Miss Crawford melodrama, but for those of you too busy or too butch to go there, the scenes featuring Sinatra’s pad are screen-capped here. The story of how Frank Sinatra got this home is fairly well-known: upon deciding he wanted a permanent residence in the then-sleepy desert town of Palm Springs, Frank walked into the office of E. Stewart Williams and simply said, “I want a house.” Sinatra was thinking traditional columns and bricks, but for his first residential commission, Williams went with modern design. 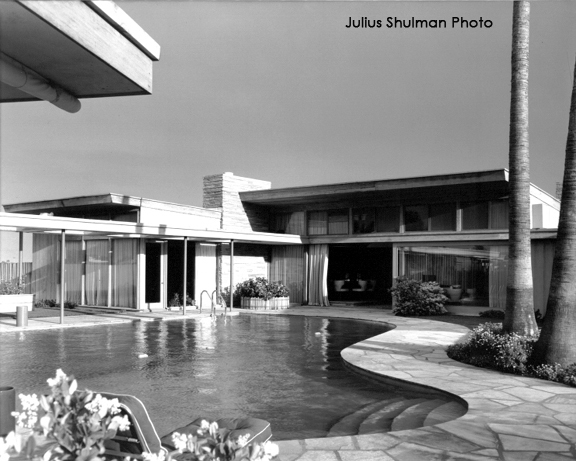 Shortly before he died, Williams talked about presenting the drawings of the home in the film about Julius Shulman, Visual Acoustics. 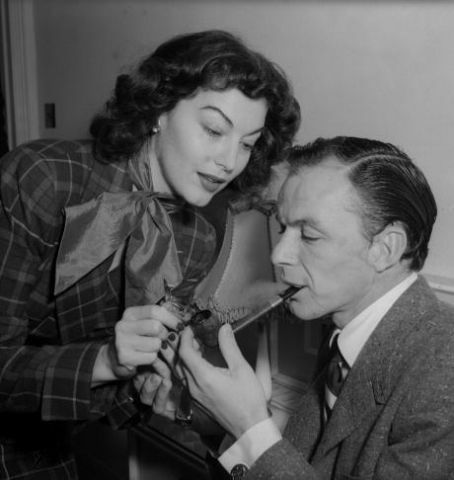 Williams remembered that Sinatra was surprisingly open to such a radical departure from what he’d asked for, and the meeting was very brief because Sinatra had only one criteria to make his decision: Can you have it done by Christmas? Even though it was the Summer of 1947, Williams said “yes” to the seemingly impossible: design and build a house to completion in less than 5 months. Incredibly, they missed the deadline by only a week; Sinatra didn’t do Christmas but was able to throw a New Year’s Eve Party. 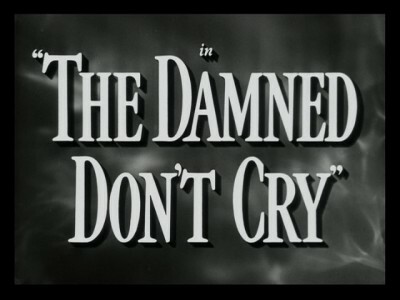 According to the Twin Palms website, Sinatra repaid a favor he owed by letting the production of The Damned Don’t Cry film at his home in 1950. 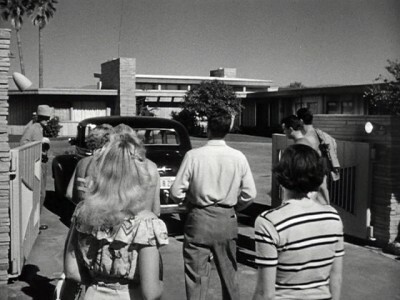 But they were only allowed to film outside, so any scenes that take place within the interior of the home are Hollywood creations that have nothing to do with what the interior of the actual house looked like. We tend to see still pictures of the home shot from the same angles, so it’s a real treat to see it in this movie from different angles and functioning as someone’s home, rather than the icon it was rapidly becoming. In the film, Twin Palms portrays the home of gangster Nick Prenta, who is in trouble with the New York Mob Boss. Miss Crawford is the mistress of said Boss, and is sent by him to spy on Nick. 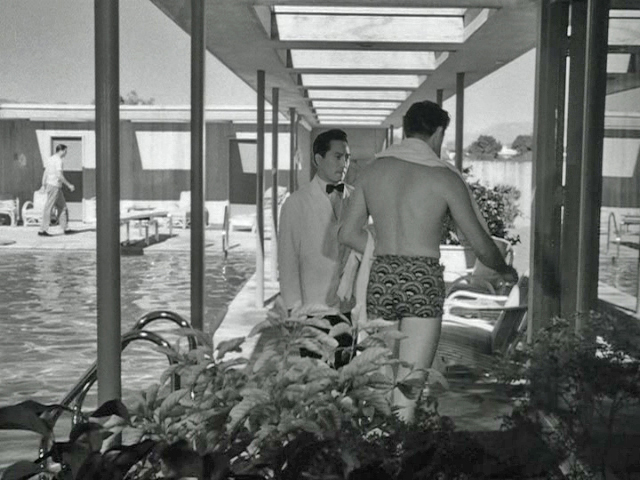 But because Nick is such a virile Italian stud (who is so secure in his manhood that he rocks op-art swim trunks), Crawford naturally falls in love with him (and his house!) and can’t bring herself to rat him out because that equals death. (Spoiler Alert) Of course, Nick gets whacked, but the violence happens in Crawford’s apartment, so Twin Palm’s had no blood on its hands, real or reel. We’re not even going to comment on the irony of Sinatra’s house “belonging” to a gangster while he himself dodged Mob rumors for most of his career. Instead, let’s marvel at these rare glimpses of the home in its infancy, and appreciate the people who have restored the place within the past 12 years. And the place did need extensive restoration; Sinatra only lived in the house from 1947 – 1957, which left many new residents to muss its essence. By 1997, it was being sold as a tear down. Scroll down 3/4 on this link to learn more. Now it’s available to any of us with lots of disposable cash to live out Frank & Ava fantasies for a weekend, a wonderful gift suggestion to add to your Christmas wish list!